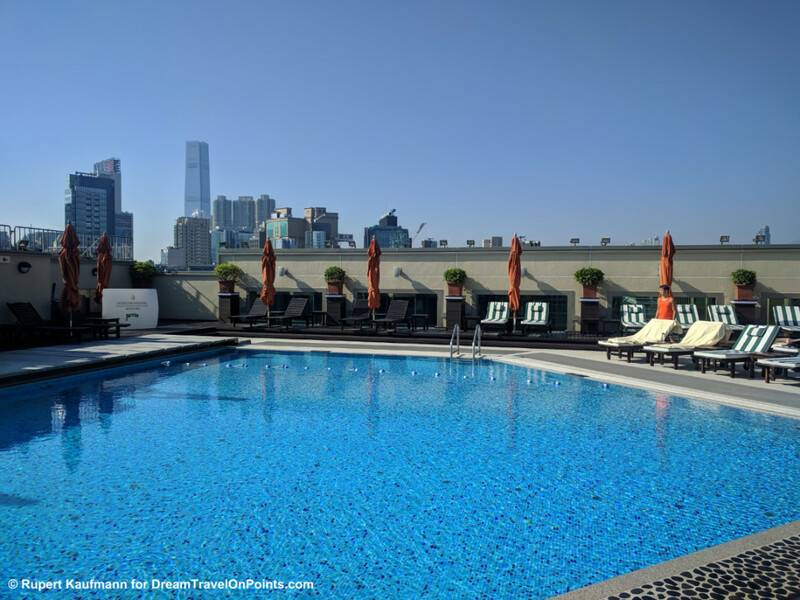 InterContinental Grand Stanford – second best InterContinental hotel in Hong Kong! The InterContinental Grand Stanford Hong Kong offers great service and renovated rooms in a waterfront location in Kowloon, at high prices typical for Hong Kong. 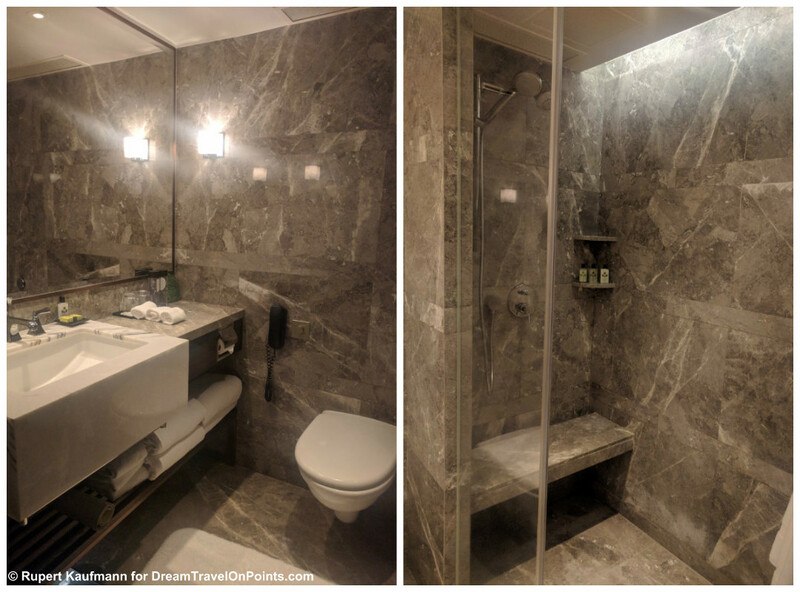 Despite enjoying a flawless stay, we are not likely to return – because the other InterContinental Hong Kong is better in every way and my recommended choice for Hong Kong! Location: The InterContinental Grand Stanford is located on the Kowloon waterfront facing Hong Kong island. It’s not as central a location as the other InterContinental Hotel and about a 10-20 minute walk from the (East) Tsim Sha Tsui subway stops and the main shopping area of Kowloon. The trip to the airport is about 45 minutes by taxi or 1h15min by Airport Express and Shuttle bus. There are plenty of coffee shops, restaurants and a few shops in the immediate area and small next-door mall. Some rooms have harbor views, but you don’t have the fantastic views of the lobby bar and restaurant at the other IC. Service & Rewards: The staff at check-in was just as friendly and professional as you’d expect at a luxury hotel. There is a separate line for IHG Rewards Club elite members, making the wait short any time I went to the front desk. I arrived early and our room was not ready till later in the day, but I was able to store the luggage. 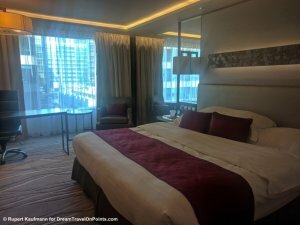 We had booked an award stay, using free night certificates from our IHG Rewards MasterCard – a great use of the free night during the very expensive New Years Eve! They combined our different reservations without issue and we didn’t have to switch rooms. Despite the reward stay, we were upgraded one category from a standard room (with interior views) to a city view room (facing the buildings across the street). We also received a welcome drink. The staff had information about the hotel and area readily available and check-out was just as quick and flawless. Housekeeping had prepared our room well and it was thoroughly cleaned each day, with all essential supplies replenished each day. Room: Our City View King Room was renovated and held n beige/brown tones with soft carpets, padded wall panels and a high, soft headboard. The bed was very comfortable with high-end sheets and a deep burgundy color bed throw. The room has large, dark brown wood cabinets for the wardrobe, the bar cabinet and drawers, with a marble top. The bar cabinet opens up over the corner, giving access to the mini-bar and coffee/tea facilities. The large work desk has a class top and a big swivel task chair. You’ll also find an Android hand phone to use while you are in Hong Kong – so you don’t have to pay roaming fees or get local service for your visit! The room is relatively small compared to the other IC and traditional in design. The bathroom is also compact, with the sink on one side, the toilet in the center and the large, walk-in shower on the other side. It’s all held in brown marble and looks very upscale. Standard InterContinental toiletries were provided, as well as large, thick towels and bathrobes. The free WiFi internet was reliable and blazing fast at an average 126Mbps – the second fastest I’ve ever measured at any hotel! Restaurant & Amenities: The InterContinental Grand Stanford has a small rooftop pool with loungers around it. Instead of the snazzy infinity pools and glass walls you find on newer hotels, this one has a concrete wall around it, cutting of the skyline views. But it is a nice enough place to relax in the sun for a little and the service staff is great! Next door is the gym located with enough cardio and weight equipment for a full workout. The InterContinental Grand Stanford has a lobby bar and Tiffany’s New York Bar, held in dark wood on the ground level. We had a drink there and it feels like a typical hotel bar. You also find the Cafe on M for breakfast, lunch and dinner, the Italian restaurant Mistral for lunch or dinner, as well as Cantonese restaurant Hoi King Heen for lunch and dinner. We didn’t try any of the restaurants during our stay and celebrated New Years Eve instead at the fantastic Lobby Lounge at InterContinental Hong Kong with million-dollar views of the skyline and fireworks! Bottomline: We booked our stay with Chase Free Night Certificates (or 50,000 points/night). Room rates for busy nights are in excess of $350/night, making a reward stay good value! 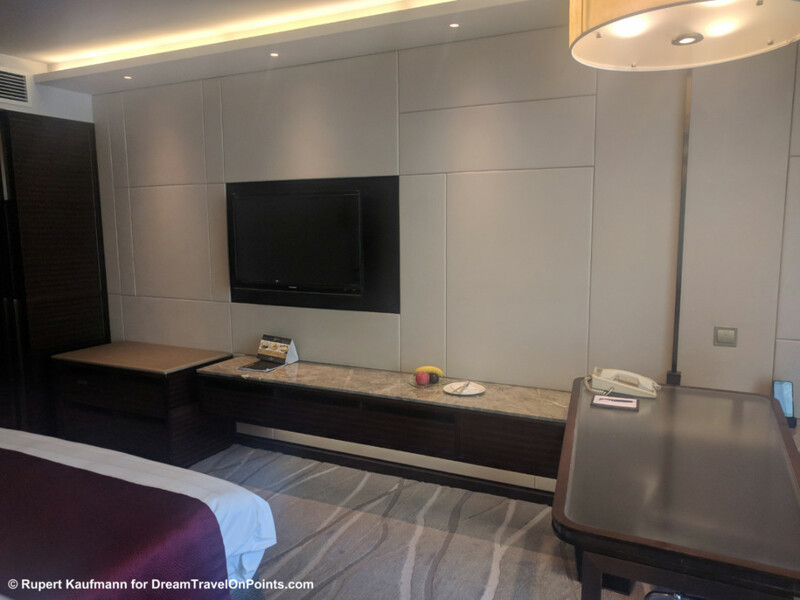 We enjoyed the room and the service and found no fault – yet in direct comparison with the InterContinental Hong Kong in a better location, bigger rooms and grand views, the InterContinental Grand Stanford only wins second prize and I’d recommend the other IC as first choice for your stay in Hong Kong. I personally would only return to the IC Grand Stanford, if the IC Hong Kong is not available!